Working with listing agents can tough in 2017. Markets like Phoenix, Dallas, and Sacramento are experiencing an upturn in competition. Many homeowners are reporting offers on their home, even though their home is not on the market. If representing a buyer, it’s important you do the best you can to get your client a home in this heated market. 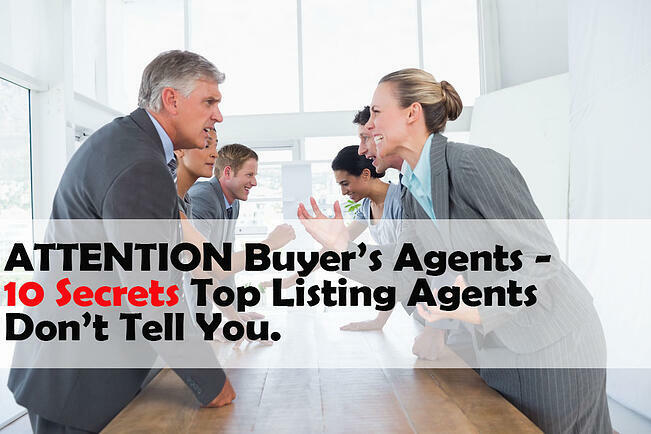 Check out this list of secrets top listing agents don't always disclose to buyer’s agents. Your buyer client’s proposed waterfront dock or tree house maybe violating zoning ordinances, even if the listing agent says it’s alright. In addition, according to This Old House, buyers can request permits of compliance contingencies, requiring the buyer to provide a permit for major renovations in the offer. This maybe necessary for large scale projects such as home additions, sheds, pools, or basement living areas. Secret 2: If your client doesn’t have a preapproval letter, they aren’t even considering your offer. Many sellers prefer a quick closing and don’t want to wait for your client’s family to receive approval. Secret 3: A personalized letter means nothing in comparison to your client’s financial profile. Personalized letters may even make buyer's agents look desperate if their client can barely afford the home. In some rare cases, sellers may be attached to a family home and may be persuaded by personalized letters. However, this is not the norm. Secret 4: Your client’s proposed down payment carries significant of weight. If your client’s proposed down payment is less than 5%, many sellers won’t even consider. If it is nearing the lower end, a seller may begin asking additional questions about your client’s financial qualifications. Secret 5: A home inspection isn’t the only contingency you can include. An offer may include many additional contingencies, including foundation & structural inspection, mold inspection, septic inspection, pest inspection, chimney inspection, well water inspection, and radon inspection. For more on which contingencies your buyers should include, check out Kyle Hiscock’s article. Secret 6: They’re already considering offers at the open house. Don’t be fooled, by the listing agent’s eagerness to speak with you. In this year’s sellers market, many homes receive offers before they get to market. Secret 7: The client, not the listing agent, has a potential buyer lined up. The listing agent will always prefer their client does not go with the buyer the client found on their own. Many home sellers sign a contract to keep their agent’s commission if they sell to a buyer they found before taking on the listing agent. Secret 8: The home inspector they referred is a close friend. Request your client to hire their own independent home inspector. Often times listing agents and brokers have close relationships with home inspectors. According to This Old House, home inspectors complain of being shunned by brokers when exposing serious home defects. Secret 9: The contract will provide adequate legal protection. A Disclaimer of Promises does not include any verbal promises the seller made beforehand. Consider forming a partnership with an attorney, to make sure anything your clients sign is not working against them. Want to know another secret? Zurple’s lead generation software can find you the most qualified buyer and seller leads in your target markets. Our search engine marketing services funnel home searchers to your IDX site, where lead contact information is captured. Upon lead capture, our Conversations® software nurtures leads with intelligent, personalized emails and text messages. These messages reference specific homes and markets the lead has previously viewed. We place the hottest, most qualified leads directly in front of you, so you close more and prospect less.